Ref: 1. Govt. Memo No.2181/SE-Trg/A2/2015, SE(Trg.) Dept., dt.7-10-2015. 2. GO.Ms.No.36 School Education (Trg.) Dept., dt.23.12.2015. 1. Online applications are invited from the eligible candidates who intend to be teachers for classes I to VIII in schools in Telangana State for appearance in the First Telangana Teacher Eligibility Test (TS-TET , 2016) to be conducted by Department of School Education, Government of Telangana State on 1st May , 2016 in all 10 Districts of the State. 3. All candidates who possess D.Ed.,/ B.Ed., / Language Pandit or equivalent qualifications and candidates pursuing final year of the said courses with requisite percentage of marks obtained as given in the information bulletin of TS-TET and who aspire to become teachers for classes I to VIII in the schools of the State Government, Mandal Parishad, Zilla Parishad, Municipality, Private Aided Schools and Private unaided schools in Telangana State can appear for TS-TET. However, the candidates intending to seek employment as a teacher in private unaided schools shall have the 2 option of appearing at CTET conducted by Central Government through CBSE instead of TS-TET, if they so desire. The candidates who did not qualify in the 1st, 2nd and 3rd , and 4th APTETs can also apply for the first TS-TET. Further, the candidates who got qualified in the earlier TETs can also apply for first TS-TET if they desire improvement over their previous TET score. 4. The test (TS-TET) will be conducted in 2 papers viz. Paper-I & Paper-II. The candidates who intend to be teachers for classes I to V have to appear for Paper-I and the candidates intend to be teachers for classes VI to VIII have to appear for Paper-II. The candidates who intend to be teachers for all classes from I to VIII can appear for both papers, Paper-I and Paper-II. The fee prescribed for appearing for TS-TET (including examination fee) is Rs.200/- (Rupees Two hundred only) for only Paper-I or only Paper-II or both. 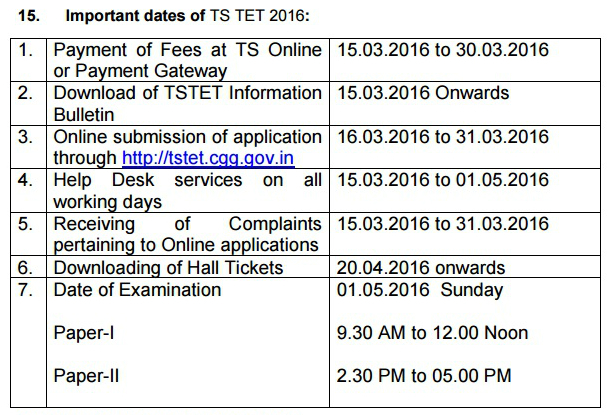 Candidates can pay the fee through TSonline or Payment Gateway centers between 15.03.2016 to 30.03.2016 and submit online application at the TS-TET website http://tstet.cgg.gov.in between 16.03.2016 to 31.03.2016. 7. Procedure for submission of application online: Detailed procedure for applying ONLINE is given in the Information Bulletin. Candidates can download the ‘Information Bulletin’ free of cost from the TS-TET website: http://tstet.cgg.gov.in from 15.03.2016 onwards. Candidates can submit their applications online from 16.03.2016 to 31.03.2016. 8. Examination Centers for TS-TET 2016: TS-TET shall be conducted in all the 10 Districts of the State. Candidate can choose any Examination Centre (District) of his choice. However, when the capacity of any particular Examination Centre (District) gets exhausted, that particular Examination Centre (District) will not be displayed in the list of examination centers given in the online application form. In such case the candidate has to choose the Examination Centre (District) of his/her choice from the remaining list available. 9. Eligibility Criteria: The candidates at the time of applying for TS-TET 2016 should be in possession of the minimum qualifications prescribed for a teacher for I to V classes (Paper-I) and VI to VIII classes (Paper-II) as given in Information Bulletin. The candidates who are pursuing final year of any of the Teacher Education Courses recognized by the NCTE or the RCI, as the case may be, and / or the Language Pandit Training Courses can also appear for the First TS-TET 2016. However , it is clarified that appearance or a pass in TS-TET by itself will not vest any right in a candidate to be considered for appointment to the post of Teacher in Government / Zilla Parishad / Mandal Parishad / Municipal and Private Aided Schools, unless he is in possession of the qualifications prescribed for appointment to such post in the relevant statutory recruitment rules framed by State Government from time to time as on the date prescribed there in for possession of such qualifications. Details of qualifications prescribed for TS-TET are provided in the Information Bulletin. 16. Exemption from passing TS-TET: Teachers who were appointed before NCTE notification, dated 23.08.2010 on selection by District Selection Committee or by competent authority in Govt. / Local Authority as per Recruitment rules prevalent at that time are exempted from appearing TET Exam. However, teachers working in private schools whose appointments were not approved by competent authority in Government are not exempted from passing TET. Such teachers of private unaided schools can also appear TET conducted by either state Government or Central Government. Teachers working in private aided schools whose appointment is not approved by the competent authority should invariably pass TS-TET only.